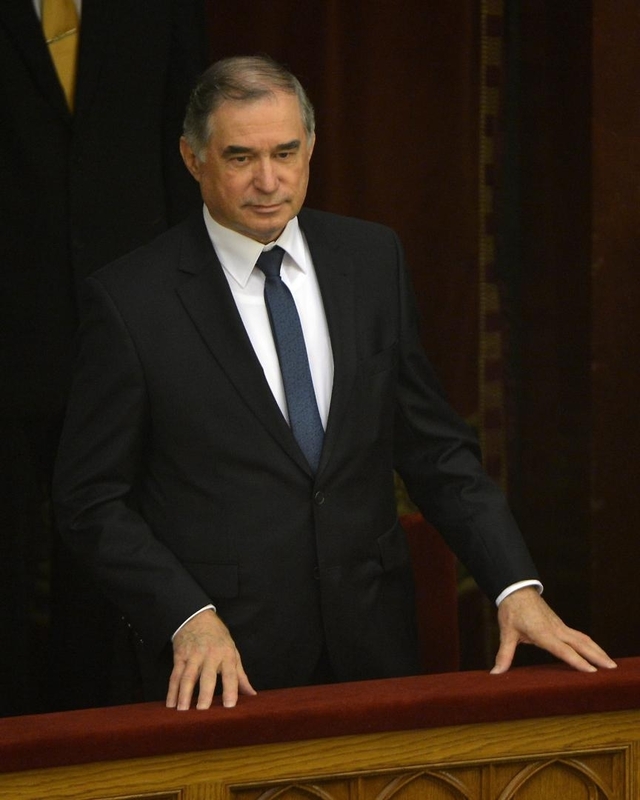 Dr. Barnabás Lenkovics was nominated by the Speaker of the National Assembly, and the Members of Parliament voted him with 132 votes. Following the election, he took the oath in front of the Parliament. On 11 November 2014, the Constitutional Court rejected the petitions of the judges of Budapest-Capital Regional Court. In its decision the Constitutional Court declared that the challenged provisions of the Act, that described the consequences of the application of unfair clauses which amended bank loan agreements unilaterally did not violate the Fundamental Law. The currency rate risk and rate spread in the loan agreements were not subject of the examination of the Constitutional Court. The Constitutional Court established in its decision on 27 October 2014, that the legal provision regarding the extent of movement and airspace of the prison cells where more detainees are placed together is in conflict with the international treaties and unconstitutional. Thus, the Constitutional Court annulled it. The first Cup of Constitutional Courts, an international futsal tournament, was organised in Budapest last week by the Constitutional Court of Hungary. The six participating teams were composed of more than twenty judges and forty colleagues of the Constitutional Courts from the neighbouring countries. 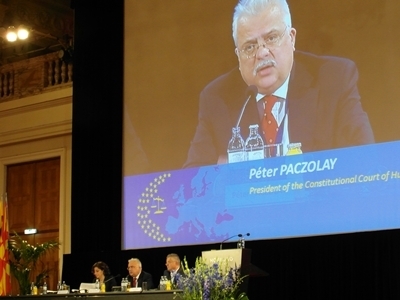 The next Cup of Constitutional Courts will take place in Austria. 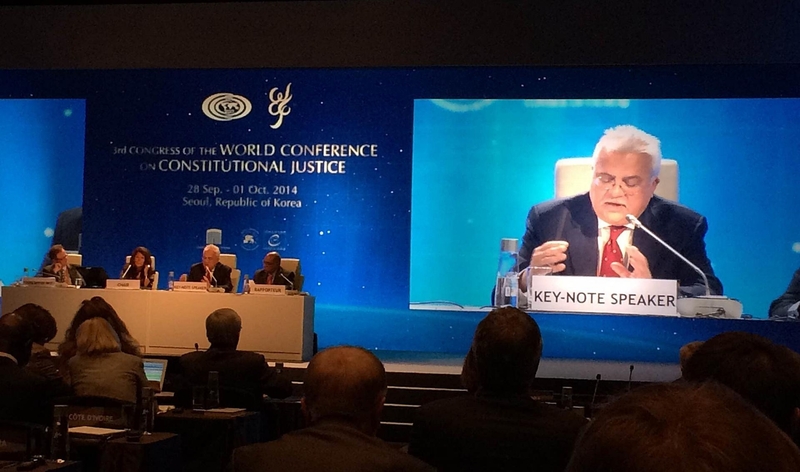 The 3rd Congress of the World Conference on Constitutional Justice (WCCJ) was organised in Seoul between 28 September and 1 October, 2014. The World Conference was established by the assistance of Venice Commission in 2009 and it unites 93 Constitutional Courts, Councils and Supreme Courts from Africa, America, Asia and Europe. The Constitutional Court declared in its decision that photographs showing police actions shall be published without preliminary permission of the concerned police officers if the publishing is not self-serving, so it is about contemporary events or news based on the circumstances of the case, or it is public information about the exercise of executive power which is of public interest. The Constitutional Court annulled the concerned judgement as it violated the freedom of press (Article IX para (2) of the Fundamental Law). 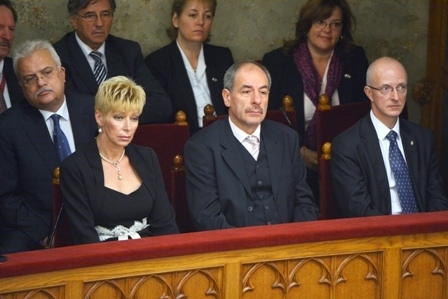 On 24 September 2014, Dr. Ágnes Czine, Dr. Tamás Sulyok and Dr. András Zs. Varga were elected to the Members of the Constitutional Court of Hungary by secret ballot. The Constitutional Court declared in its decision that the basic regulations of the municipal electoral system of Budapest are not contrary to the Fundamental Law except the rules regarding the compensation list. The unconstitutional provisions were annulled by the Constitutional Court, otherwise the petitions were rejected. On the other side, the Constitutional Court also declared unconstitutional that the voter shall request for information about his or her personal data on the registration sheet only until the decision on the registration of the candidate or until the list becomes valid. Thus, the Constitutional Court annulled this regulation too. The Constitutional Court declared in its decision that the provision of the Criminal Code, which prescribed the obligatory stricter conviction of certain cumulative offenses in case of the perpetrator committed at least three violent crimes against persons at different times, is contrary to the Fundamental Law. The concerned provision was annulled with retroactive effect (from 1 July 2013). The Constitutional Court examined the submitted constitutional complaints concerning the provisions of Act on the Integration of Cooperative Credit Institutions. Although the Constitutional Court rejected the petitions which alleged that the whole Act is contrary to the Fundamental Law, it declared that two provisions are contrary to the Fundamental Law and annulled them in its decision. Furthermore, a constitutional requirement was declared as well. According to the Curia, the petitioner – the Association of Hungarian Content Providers – violated the right to good reputation when the content of two comments in a website − which was operated by the petitioner − exceeded the limits of freedom of expression. The Constitutional Court has declared that the organisation and composition of the Hungarian Academy of Arts shall be in compliance with the constitutional requirement of artistic freedom. Furthermore, it has been declared that the Act on transforming the Academy to public corporation was not fully in conformity with the requirements of neutrality and pluralism deriving from the freedom of art. The Constitutional Court declared the unconstitutionality and annulled the regulation of the Labour Code which prescribed that pregnant woman or who is participating in human reproductive process are entitled to protection against dismissal only if she had informed her employer about her condition before the dismissal notice. According to the decision of the Constitutional Court, same amount of family allowance shall be paid not only for the married parents but also for the unmarried parents who care their children in common household. In order to ensure the enforcement of this principle, the Constitutional Court has called upon the Parliament to perform its legislative task and to rectify the unconstitutionality until 31 December 2014. The Constitutional Court declared in its decision that the provisions of the Act on the Elections of the Members of the Parliament concerning the surplus votes do not violate the constitutional requirements concerning the equality of right to vote. The Constitutional Court rejected a constitutional complaint against the decision of the Curia which allowed the placement of campaign posters to lampposts. The Constitutional Court declared in its decision on 17 March 2014 that the amendment of the Act on National Security, which permitted continuous national security control and – during this process – secret information gathering for thirty days two times a year against the person who was under national security control, was contrary to the Fundamental Law. The Constitutional Court in its decision on 17 March 2014 – following the petition of the government – interpreted those provisions of the Fundamental Law which may influence the legal assessment of the contracts and their amendment by law. The Constitutional Court declared that a legal regulation may exceptionally – in case of unanticipated and significantly changed circumstances of the conclusion of the contact – amend the content of those contracts that had been concluded before the concerned legal regulation entered into force. The Constitutional Court announced its decision in public. The Constitutional Court declared in its decision on 3 March 2014 that the provision of the new Civil Code which allows wider criticism of public figures only if it is justified by ”appreciable public interest” (Section 2:44) violates the freedom of speech and press ensured by the Art. IX. of the Fundamental Law. Therefore, the concerned regulation was annulled and the new Civil Code will enter into force without this restriction on 15 March 2014. Furthermore, the reasoning of the Constitutional Court defines the frames among which the human dignity of public figures ensures protection against the freedom of speech and press. 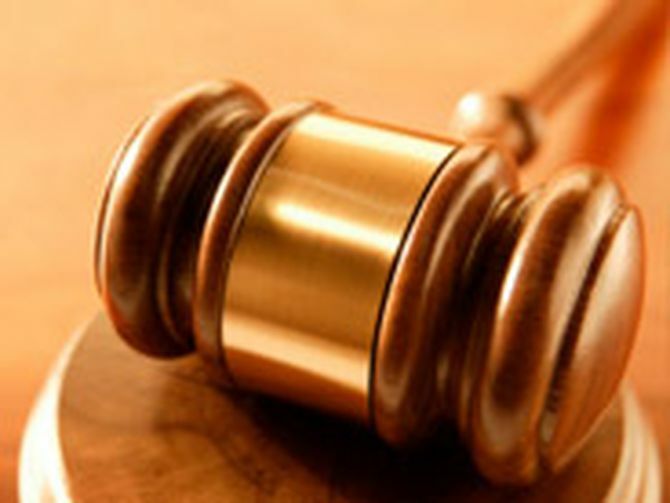 The 98% tax on severance pay is contrary to the Fundamental Law and to international treaty, therefore the Constitutional Court prohibited the application of the concerned regulation according to its decision on 24 February 2014. The Constitutional Court has declared in its decision of 11 February 2014 that the acting courts ought to examine in merits the petitions when the public is restricted referring to decision-making character in case of a procedure regarding the denial of realising data of public interest. The Constitutional Court has annulled the decision of the Curia in the case of request for data from the Pécsi Vizmű Ltd. 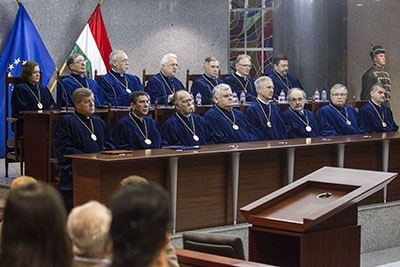 The Constitutional Court has annulled two decisions of the Curia (Supreme Court) in the case of a judge under criminal procedure, because of unconstitutionality of the verdict. According to the reasoning of the decision, the judicial independence includes that a judge is entitled to get remuneration even if he or she is suspended from office due to an ongoing criminal procedure. Incompatibility rules are related to the judicial position, therefore pursuance of any further gainful occupation is limited.